Food and Drink Tin Sign: The classic, sophisticated Manhattan was the drink of choice in old New York, sipped in trendy clubs the tasty treat was served on the rocks or in a stylish triangular glass with a cherry or twist of lemon. 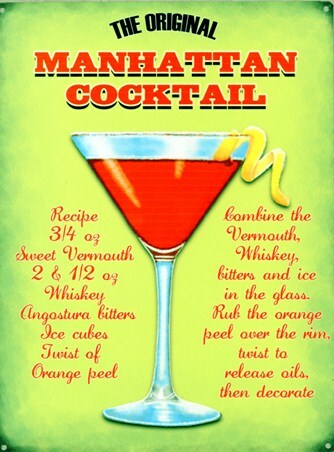 Now with many variants of the classic combination, the Manhattan is also known as a Rob Roy and the Royal Manhattan to name but a few but, this fantastic tin sign has all the ingredients of the original recipe and an easy to follow method so you can create the classic cocktail in your own home. On an eye catching lime green background the cherry red Manhattan stands out like the classic treat it is, for every cocktail connoisseur this fine example is a must to embellish your walls. 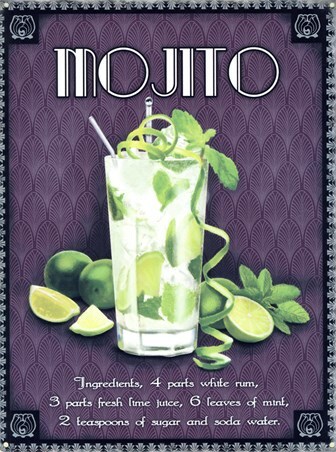 High quality, framed The Original Manhattan Cocktail, Classic Recipe tin sign with a bespoke frame by our custom framing service.